Across the universe, countless aliens have taken to the stars, seeking to spread their influence to the far reaches of space. Some might be great diplomats, turning to negotiations to accomplish their goals. Others might be more warlike, attempting to conquer everything in their path. Still others may be ruthless, or cunning, or very, very quirky as they attempt to colonize new planets. No matter what, when these aliens cross paths, anything is possible. The Cosmic Age has begun. Cosmic Encounter 42nd Anniversary Edition is available now at your local retailer or online through our webstore! Order your own copy of the new edition of Cosmic Encounter at your local retailer or online through our website today! For more than a generation, Cosmic Encounter has stood the test of time and become an unmitigated classic. Featuring enhanced components, an additional alien species, and several improvements designed to welcome new players, Cosmic Encounter 42nd Anniversary Edition offers you the chance to experience the definitive version of this time-honored game of intergalactic colonization. In every game, you’ll launch your ships through the Hyperspace Gate in bold bids to establish colonies on foreign planets. You’ll forge alliances with other players—and break them just as quickly. And you’ll take advantage of your alien’s unique power. Answer the call of the cosmos and enter the new cosmic age! 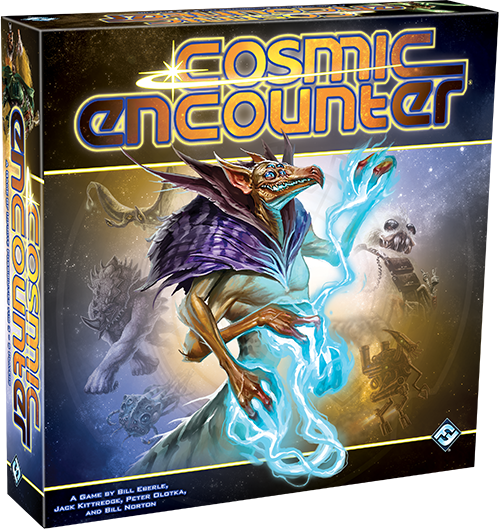 With a diverse cast of aliens, each with its own history and powers, Cosmic Encounter is truly a game of infinite possibilities. The anniversary edition maintains the wacky, fast-paced gameplay that makes the game so memorable, while also adding an extra layer of polish. Featuring beautiful translucent ship pieces, a freshly revised rulebook, a comic-book illustrated Quick-start Guide, and the previously unreleased Demon alien, this new edition is the perfect way to experience Cosmic Encounter. Over the past few months, we’ve explored every detail of Cosmic Encounter 42nd Anniversary Edition in a series of previews, beginning with a look at the new Cosmic Combo cards introduced in this edition. 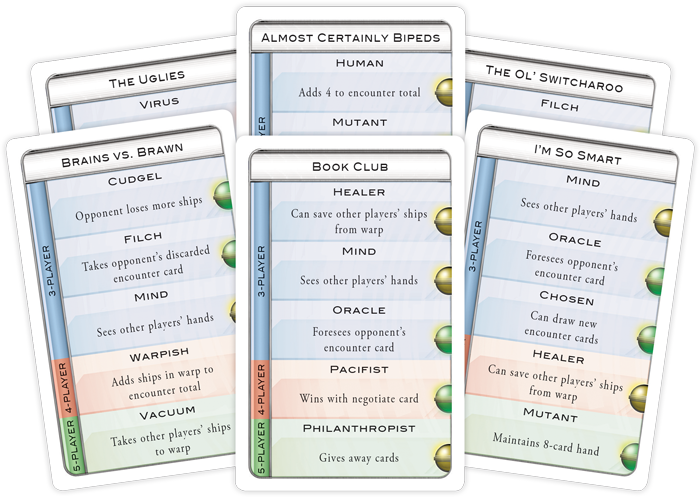 Each of these 34 cards offers a different mixture of the 51 aliens included in the game, with combos carefully selected to help you create themed matchups and explore different types of games. Next, we discussed the creation of this new edition with producer Molly Glover. Here, we got a chance to ask Molly what it was like to develop the latest version of an established classic like Cosmic Encounter and hear why she thinks the game has held strong for more than four decades. 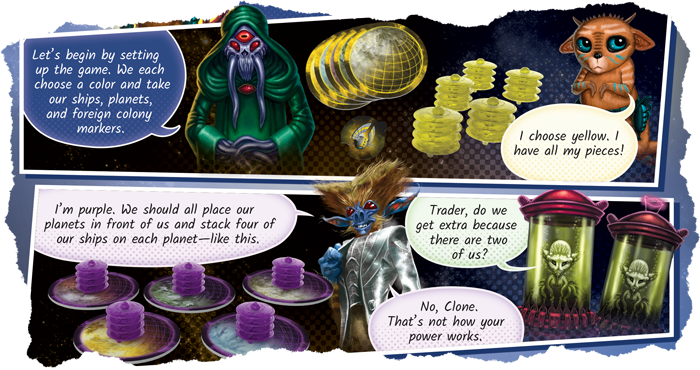 Finally, every cosmic conquest has to begin somewhere, and our final preview gave you a look at the new Quick-start Guide included in Cosmic Encounter 42nd Anniversary Edition. While the goal of any game of Cosmic Encounter is to establish colonies on five foreign planets, any number of things can happen in the process of reaching that goal. You could forge or break alliances with other players, research new technology, or use your abilities to outsmart and outmaneuver your opponents—and this guide is an invaluable way to get started on this path. It runs you through every aspect of the game, helping you set up and providing an overview of an encounter. It even helps you get the most out of your alien power by explaining exactly when you can use it! Aliens from across the stars are meeting in momentous encounters that will determine the fate of the universe. Now, you can step into the cosmos and experience this classic game of intergalactic conquest for yourself. Enter the cosmos with Cosmic Encounter 42nd Anniversary Edition! Pick up your copy of Cosmic Encounter 42nd Anniversary Edition (CE01) at your local retailer or online at the Fantasy Flight Games website here! 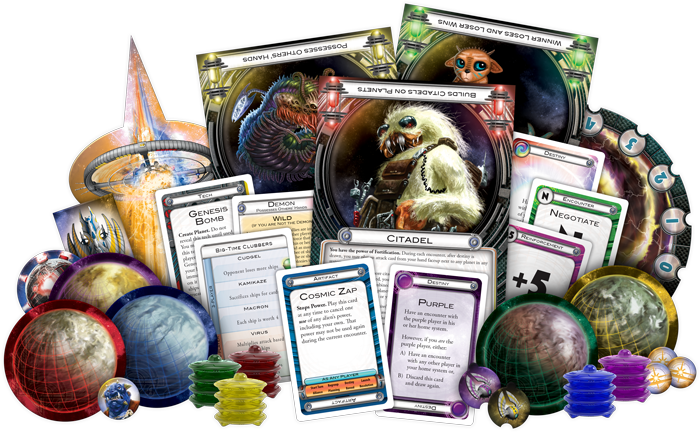 Cosmic Encounter is a board game that puts players in charge of the fate of an alien species. Three to five players each strive to be the first to gain five foreign colonies. With over 50 alien characters to choose from, no two games are ever the same.